Did You Know: Rats do not have exceptional eyesight, they rely on their senses? When mice and rats enter your home, do not beat yourself up about it. They are like vultures and their priority is to find food and shelter where they can. If your house is available, they will invade. Because they do not possess wonderful eyesight, they rely on their other senses such as smell, touch and taste to navigate around your wonderful home. Sharing your home with mice and rats can be a health risk to you and your family. With them always scurrying over areas in your home, they may leave germs from their feet behind. Yes, you do know that those little feet were crawling in sewers and trash cans. Rat can transfer various diseases by biting, urinating and leaving their droppings, all over your once so clean home. There are areas in your home that can be attractive to mice and rats. If you keep garbage bins outside which have easy access, this attracts rats to your home. Make sure to use bins which seal in such a way where they cannot access it. Do not throw food leftovers into compost pots, because this attracts rats. If you have pets outdoors, do not leave their food and water out all day and night as this can attract pests. If you feed birds, use rodent-proof feeders and always clean up the birdseed that falls to the ground under the feeders. Minimize water sources outdoors by repairing plumbing leaks and cover outdoor pools. If you store firewood for those braai days and winter evenings, store it at least 1 meter off the ground to prevent rodent infestation. 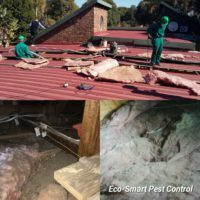 Eco-Smart Pest Control cares about your family and their health.